Ventura, Calif.—The Museum of Ventura County and the American Institute of Architects Ventura County (AIAVC) present Design in the Making, a community Architectural Exhibit exploring the dynamic role of architects and designers in affecting positive change in our community through the creative design process. The Opening Reception will be held on Saturday, February 16, 2019 from 3 – 5 p.m. and will include refreshments and a no-host bar. Admission is Free for museum and AIA members, $5 for non-members. For more information, visit venturamuseum.org or call 805-653-0323. Design in the Making runs through May 19, 2019 and will feature the Museum of Ventura County’s architectural archives opened to the public for the very first time, and local built and un-built projects highlighting the evolving conversation inherent within the design process with a window into the future. “Ventura County’s architectural diversity creates a landscape of historic relevance that defines the vernacular of our culture,” said Anna Bermudez, curator for the Museum. 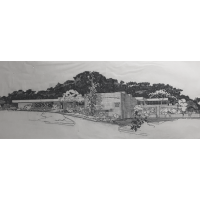 “The exhibit will present a cross-section of styles that reflect the influences of immigration and its cultural impact on housing and community buildings throughout the decades and throughout the county. Accompanying the exhibition, programs throughout the duration of the exhibit include live interactive design charrettes where Designers-In-Residence and Community will come together to create solutions to local place making issues. The AIAVC will host a Scholarship Fundraiser to benefit students planning on pursuing careers in architecture, and to announce the 2019 Scholarship Recipients, Friday, May 3, 2019 from 6-9 p.m. followed by a free activity, “Kid Draw Architecture,” on Sunday, May 5, 2019 from 2-4pm. For more information visit AIAVC or call 805-749-6809. This exhibit is made possible through the generous sponsorship of Ashley & Vance Engineering, Coast Reprographics, Mary Follenweider AIA, Neel Lighting, and Staples Construction. Additional support provided by the City of Ventura, Ventura County, and private funders. Established in 1965, the AIAVC is a member-driven organization providing advocacy, leadership, and resources for architects. Its mission is to promote personal and corporate growth, strength and sustainability of the membership as architects and citizens of Ventura County. This is done by Engaging, Encouraging and Educating the membership and the community at large. For more information visit AIAVC or call 805-749-6809. The Museum of Ventura County celebrates, preserves and interprets the art, history and culture of Ventura County, the California Channel Islands and the surrounding region through its collections, exhibitions, events, educational programs, publications and its research library, and serves as a gathering place for the community. The Museum has two locations. The main museum is located at 100 East Main Street, Ventura, CA 93001 and is open Tuesday - Sunday 11 a.m. – 5 p.m., 805-653-0323. The Agriculture Museum is located at 926 Railroad Avenue, Santa Paula, CA 93060 and is open Wednesday – Sunday 10 a.m. – 4 p.m., 805-525-3100. For more information, visit venturamuseum.org.